The truth often sounds extremely mundane, but healthy teeth really do require treatment less often than diseased teeth. Everyone can contribute to the long-term preservation of their dental health by taking the following preventive measures. Daily oral care should be a matter of course. When purchasing toothpaste, ensure that it contains fluoride and active agents to combat plaque. Teeth brushing should be complemented with the use of floss or an interstitial flossing brush; using clinically-tested mouth wash on a daily basis has also been proven to be beneficial. 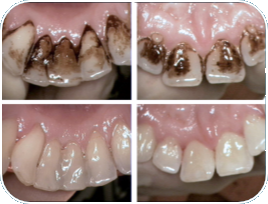 Scientific studies show that professional cleaning at the dentist is the ideal complement to daily oral care. 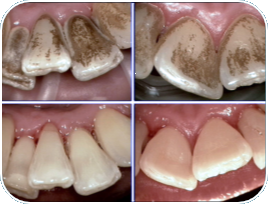 When performed consistently and regularly, it can help preserve teeth and gums into old age. Teeth cleaning often isn’t enough to effectively remove all plaque from on – and particularly between – the teeth. Complementary aftercare is also indispensable in the event of periodontitis, and protects against any other diseases of the teeth and gums. At the start of the professional teeth cleaning, hard and soft plaque is stained with a special solution before being removed from all visible surfaces and between the teeth. 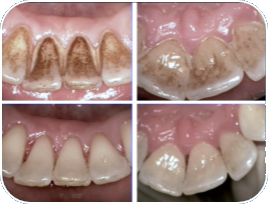 Discolourations caused by coffee, tea and cigarettes are also eliminated using special instruments such as the Air-Flow®, after which the soft plaque is removed. Various hand-held instruments, small brushes and floss are used. Because bacteria collect on rough surfaces and in gaps first, the teeth are polished to smooth them before being coated with fluoride, which protects from acid attacks by oral bacteria. Optimal care means a check-up at our practice every six months. This allows for minor damage to the teeth and gums to be detected at an early stage. Problems with fillings and dentures as well as changes to the mouth mucosa and jaw joint can also be determined early on through regular check-ups.